The Blind Date: The idea of a blind date makes sense: Person A tells Person B of their dating struggles. Person B tries to match qualities of Person A to friends and acquaintances. Finally, Person B finds Person C to match up with Person A. Person A and Person C go on a "blind date," realize they are meant for each other, and continue toward marriage. 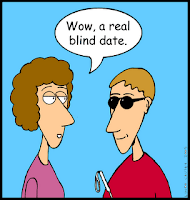 Most single people cringe when they hear "blind date." When describing a blind date experience, most singles would refer to them as "boring," "terrible," "really bad," and the like. I think blind dates are ideal for the most part. There's no need to find someone. Another person plans the date, and you simply show up. There's no obligation. If all goes well you've added another person to the dating pool. A second date implies that both parties are interested. If all ends after the first date, then you've eliminated yet another person from the "potential" list and you move on. There's no guilt in never seeing that person again. It's not as if you're distancing yourself from a long-time lover. You're simply avoiding ever having to spend time with the same person you suffered with for 6 hours on a date because your friend thought you'd be the perfect couple. No awkward break-ups. No heartache. No doubt. You can learn a lot about what your friends think of you by the quality of the blind date they set you up with. If upon meeting your date you think, "Are you kidding me?" then you'll realize how little your friend knows you. If, however, you think "Wow, this is going great!" then you and your friend can enjoy an even stronger bond than before because you are both on the same page. Spending valuable time and money on someone you don't care about. Hating the friend who set you up. Receiving stalkerish texts from a blind date who just doesn't understand that you aren't interested, even if you don't call back. All in all, blind dates are just fine. You just may meet your future spouse. If not, at least you have a new funny story to share with friends. but I still hate blind dates. they make me feel like a performing monkey -- like I have to be in constant impress-this-guy mode. blind dates put both parties on trial, since they didn't come about from a mutual attraction or liking in the first place, they're just two people that get thrown into a car together and told, "okay. your mutual friend likes both of you. now captivate each other."